Electronic publishing has been gaining ground in recent years and is now a recognized part of the digital world. In the most comprehensive assessment of electronic publishing to date, thirty-one scholars, librarians, and publishers focus specifically on scholarly publishing. They analyze a number of case studies and offer original insights on a range of topics, including the financial costs involved, market forces, appropriate technological standards, licensing issues, intellectual property, copyright and associated user rights, and the changing roles of researchers, publishers, and librarians. The editors begin with an overview of scholarly communication and develop a novel interpretation of the important role that technology now plays. Many of the following chapters are based on actual electronic publishing projects in the sciences, social sciences, and humanities, so the evidence and data are drawn from real-life experiences. Of special value are the attempts to measure costs and patterns of usage of electronic publishing and digital libraries. Electronic publishing has moved well past the experimental stage, and with numerous projects under way this seems an appropriate time to assess its impact on the academic world, from teaching to research to administration. 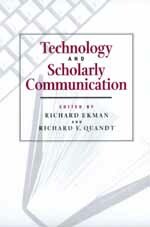 Richard Ekman is Secretary of The Andrew W. Mellon Foundation in New York, which organized a conference on scholarly communication and publishing in 1997. Richard E. Quandt is Professor of Economics Emeritus at Princeton University and Senior Advisor to the Mellon Foundation.